Saturday night was what we all lived for. All week we would look forward to the weekend. Friday evening would always start with Ready Stead y Go. Often cited as a mod institution, in our eyes nothing was further from the truth! We considered the programme to be pants! Staffed by presenters we considered to be totally at odds with everything truly mod. Keith Fordyce looked like someone’s grandfather, Cathy McGowan (self proclaimed Queen of the Mods) was some ‘posh bird’ who had no street cred and according to all the mod girls we knew had no influence whatsoever. Then there was Patrick Kerr – showing everybody how to dance! Please! Go into any West End club on a Saturday night and one could see the real dancers! It’s a bit like Lionel Blair giving instructions to Northern Soul fans on how to dance at Wigan Casino! No, the only reason we watched Ready Steady Go was the music. The programme featured many of the artists we had come to revere. I can remember James Brown, Otis, Prince Buster, Sonny Boy Williamson, Marvin Gaye, Supremes, Martha and the Vandellas, Solomon Burke plus all the UK R&B bands like the Stones, Animals, Kinks etc. Friday night would sometimes be spent visiting pubs– many of which featured live bands. The Green Man in Bethnal Green or The Two Puddings in Stratford or perhaps the Angel, Edmonton or the Somers Arms in Kings Cross or even further afield like the Apples and Pears at the Elephant and Castle. We had to be careful as we were on foreign ‘turfs’. 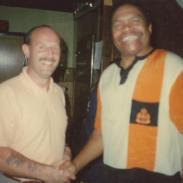 Occasionally we might venture into dancehalls such as the Tottenham Royal or the Downbeat in Finsbury Park or even out in the sticks to Watford Top Rank or the Stevenage Locarno. Occasionally we might get an invite to a blues party. One of our number worked as a butcher in Hornsey Road. The shop had a large West Indian clientele and he developed a good relationship with the ladies. This led to invites to blues parties. These parties were held at the house or flat of the ladies in question. There was a small entrance fee and once inside we were able to buy curried goat and rice and Red Stripe lager (all at a cost of course!). The organizer made a little money and these were great nights featuring some fabulous music. Bluebeat (early Ska) was the order of the day and it was at these parties we were introduced to the music of Derek and Patsy, Higgs and Wilson, Derrick Morgan, Laurel Aitken, The Foulks Bros and the mighty Prince Buster. But it was Saturday that was the highlight of the weekend. We would meet up in the pub early in the evening and draw up our battle plans. 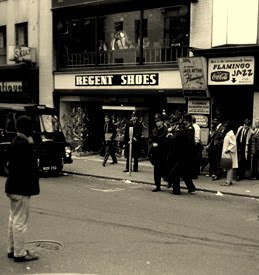 As far as I was concerned there was only one final destination – Wardour St.
Wardour St on a Saturday night – the pavements were alive with prostitutes and their minders, nervous looking punters, doormen, touts, villains, a few tourists and hundreds of mods all looking for excitement. 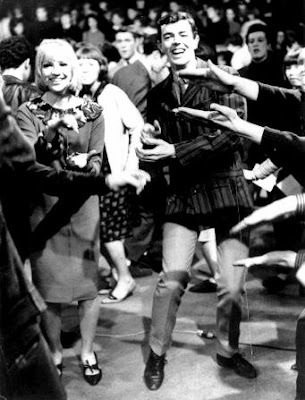 The quest for the ‘buzz’ meant different things to the many characters that thronged Wardour St but to the mods it meant the clubs! The Flamingo, La Discotheque, The Scene, the Last Chance, The Marquee, Ad Lib, London Cavern – all within a few hundred yards of each other. There were the coffee bars – The Coffee An, Le Macabre, Freight Train, 2 I’s – pubs such as the Intrepid Fox and the Eagle – all full of mods with one thing on their mind – to have good time! The excitement of entering a club for the first time – walking up the stairs to La Discotheque, handing over my cash then the door was opened. Stepping into the darkness, dozens of sweating bodies dancing in a frenzy, the heat was oppressive and then there was the music! The opening bars of ‘The Midnight Hour’ earthy, edgy almost dangerous – I was hooked for life. This was where I belonged! My first experience of a Soul giant live – Solomon Burke at the Flamingo. Struggling to get near the front, pushing through the crowd. The band taking the stage resplendent in their mohair suits. Suddenly there he is dressed in all his finery. The ermine robe and the crown – the King of Rock and Soul! I can remember little of the next hour until finally the band break into opening bars of ‘Everybody Needs Somebody to Love’. The crowd goes wild. Solomon beckons a young lady to join him. It’s Dusty Springfield! They bring the crowd to a new high. Then all too soon its all over. King Sol has gone and Dusty is back at her table with Madeline Bell. A night that will live in my memory for ever! It seemed that this was all we ever wanted in life. The music, the clothes – it could not get any better, could it? Well there were the drugs of course! Purple Hearts, Bombers, Dexys – all were freely available – at a cost! Initially we, like so many others, would purchase our supplies from various spots around town but as time went on we realized there was money to be made. One of our acquaintances had a contact in the trade as they say. He managed to acquire 7,000 Dexys but got word that the ‘old bill’ were going to ‘turn over’ his flat. A local villain of some notoriety, he could not afford to get busted so asked if we would be interested in taking his stash off his hands? What a silly question... We agreed to shift the material on a 50/50 basis and so we entered into the drug trade. Our supplier was able to accommodate our needs for some time and the arrangement proved very beneficial to all concerned. We normally hid our supply on a building site at the bottom of Wardour St keeping enough on our persons to supply initial demands. It did not pay to carry too much at one time. We would make the rounds to La Disc, the Scene and the Flamingo and every so often pop back to the site for fresh supplies. We had usually been cleared out within a couple of hours apart from a little something kept back for personal use! Soft drugs were considered to be something of a nuisance at that time and the police initially treated such as a minor irritant. But pressure began to build especially from the press and soon the police were carrying out raids on the West End clubs. The paddy wagon would arrive outside, police would seal the exits (usually only one!!) and the punters would be searched and questioned. They would usually find a few under age kids and sometimes a few drugs (the floors were usually awash with tablets!) and they would be carted off to spend the night in a cell at West End central. Their parents would be informed and they would be charged and bailed in the morning or just given a ticking off. All fairly harmless but the club owners were the ones being hassled by the police. Objections were being raised by the police when licenses were being sought and it was inevitable that many clubs would be forced to close eventually. It was the Bank holiday weekend. Plans had been laid to head for Brighton. But that was tomorrow. Tonight the Who were playing at St Josephs Hall on Highgate Hill. All the gang were going – well, we had to really. This was our manor and we needed to be in attendance. The hall was jam packed when we got there. We were ‘suited and booted’. I was wearing a pair of bottle green three ply mohair trousers that I had bought a couple of weeks ago and pale yellow button down shirt. I was wearing a pair of desert boots that I had dyed dark green to go with the trousers! The floor was packed with girls dancing around their handbags as girls do. The band was due on shortly so we grouped near the stage and ‘eyed’ up the audience. One of the lads spotted a couple of guys from Tolly Park. That was a small area near Finsbury Park which was aligned to the Highbury mob. The word went about quickly and we knew there would be a ‘hoot’ before long. 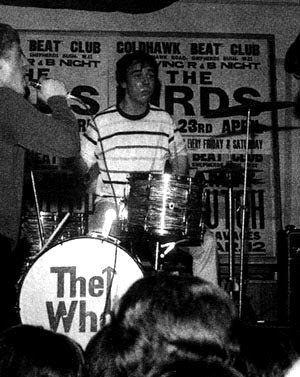 The band were introduced and went into a cover of ‘Heatwave’ Roger Daltrey was strutting his stuff and Townshend and Keith Moon were doing what they were expected to do – acting out the Who persona. The girls on the floor were lapping it all up. Another Motown cover followed and then the band went into ‘Bald Headed Woman’. This was better. Suddenly it was off! A couple more of the Tolly park boys had arrived and words were exchanged and then the place erupted. Girls were screaming and a general melee had broken out in the middle of the floor. I steamed into the middle of the ruck and the next thing I remember was waking up under a table at the side of the stage with a sore jaw! The band was still playing and had now gone into the ‘smashing the guitar’ scenario. The police had arrived and were pulling a few bodies out for questioning – just going through the motions. We decided to make a move and headed off to ‘The Cat’ on Highgate Hill. A couple of pints later and Keith Moon and Pete Townshend arrived in the bar and Moon was soon holding court in his usual loud manner! Early next morning we met up at Victoria. There were six of us. The station was packed with Mods heading down to the coast. I only had enough money for a single ticket – but what the hell! I wasn’t going to let something as trivial as money stop me. The ticket inspector on the platform was endeavoring to stop the horde passing by without checking their tickets – some chance! We found a compartment and settled down for the journey. Word was going around that Keith Moon was on the train. Twenty minutes later someone shouted that the inspector was making his way along the corridor. I was the only one without a ticket so it was quickly decided that the overhead luggage rack was my next port of call. Up I went to be covered in a pile of coats. The inspector duly arrived and left and down I came once the coast was clear! I am sure he must have sussed what was going on but had more common sense than to create a scene. 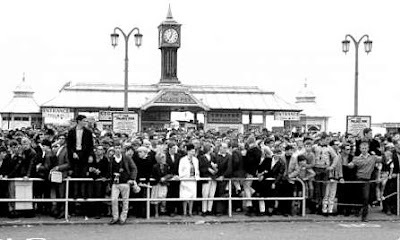 Brighton was wall to wall Mods. The police were out in force trying to maintain some order but with little success. We grouped on the beach. We spotted a few faces from La Disc and joined them. Several people had transistor radios so they tuned them to the same pirate station to gain a little amplification. Suddenly the cry went up ‘Greasers!’ the mob rose as one and began to run. We dutifully ran with them. There was no sign of any Rockers but that did not seem to bother the mob! We ran off the beach and up into the town. Windows were smashed and general mayhem seemed to be the order of the day. The police charged and we scattered, running down side streets to regroup back on the beach. This procedure was repeated several times over the course of the day. Every so often a group of Rockers would cruise past on their bikes and insults were hurled along with a few stones! The police managed to keep the warring factions well apart in the main. As evening fell we began to look for a spot to spend the night. We decided the gardens of the Pavillion would be a good spot so we found a quiet spot and decamped for the night. It must have been around 1.00am when I was awoken by the boot of a copper in my ribs. I won’t repeat his words but he intimated that he would like us to move. As there were several of his compatriots in attendance we decided to accede to their wishes. We ended up on the beach under the pier with several dozen other sorry looking specimens for the night. It was cold, damp and miserable. By morning we were soaked through and my feet were wet... We were down to three in number now. One had been carted off by the police yesterday and the others had wandered off somewhere. We decided we had had enough of the ‘sea air’ and were going back to London. A quick examination of our resources revealed that we had very little between us. The others had return tickets so we pooled what little we had and that left me enough to buy a ticket to Redhill. I would be Ok once on the train. So, ticket in hand I marched up to the barrier. A couple of ticket inspectors exchanged glances and nodded to a nearby copper. The next thing I knew I was being manhandled along the platform to where a group of dejected looking Mods were standing waiting for a ‘special’ train to take them to Redhill!! Meanwhile the train to Victoria was about to leave. I spotted my mates at one of the doors and took the bull by the horns as soon as the train moved and made a dash for it. It was like a second rate western! They held the door open whilst I ran alongside being chased by a portly copper until they grabbed my arms and pulled me in! Cold, tired, sore ribs and skint!! I’d had enough of the seaside!! The final straw came when I removed my desert boots to reveal two beautiful dark green feet!! !